Miracle Bamboo Pillow Review - Is It Worth Buying? 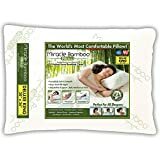 The miracle bamboo pillow is a reputable brand that strives to provide some of the best pillows for your comfort and relaxation. Its target market is adults with different forms of allergies as well as different kinds of sleeping problems. If you look, at most of the miracle bamboo pillow reviews online, you will find that most agree that it can allow you to have uninterrupted sleep. This is because it is anti-microbial, hypoallergenic and easy on the body. Besides, it can easily conform to the shape and weight of your body, bouncing back to normal even after use. You can use it for different sleeping styles and it will not give you any problems. Moreover, this miracle bamboo pillow comes in two sizes with different price tags, queen and king size. You can use it on its side for a softer kind of feel, put it flat for a medium level of firmness, fold it into half, and use it as a booster when reading or watching television. Its main material is bamboo fibers. It combines a very special blend of high quality shredded memory foam with a revolutionary outer cover made from the viscose of the bamboo fabric. It comes at an affordable rate and is very easy to clean and maintain. You can just machine wash it as stipulated in its care label. Likewise, when it comes to replacement time do as advised for a chance on continuity in comfort and support level. 3-In-1 supportive design– This miracle bamboo pillow can be soft, medium and extra firm, depending on how you place it. This means you can prop it up on its sides for a fluffy and plushy feel and support or lay it flat to support and cradle your neck and head region. You can also fold it in the middle and use it as a bolster while reading or watching TV. Temperature Regulated– With this versatile shredded memory foam, you can rest assured you will not get any sleep interruptions. It is naturally breathable and temperature regulated, allowing you to stay cool throughout the night, even as you sweat. Besides, its multi-layer design also ensures you have a gentle warm feel, during use. Durable– You can use it for some time before it starts giving you. This is due to its strong and durable material construction as well as features that enhance its performance. Some of these natural features are anti-microbial properties, hypoallergenic, resistant to odor, allergies, mold, dust mites as well as germs. Versatile– It does not matter you sleeping or sitting position, you can use this pillow for support and comfort no matter the resting and relaxation posture. This means it is ideal for all kinds of sleepers. It can never go flat but can easily bounce back and hug you as expected for extra comfort. Very comfortable and fluffy, can keep its fullness and volume for more than a year. The miracle bamboo pillow comes in two sizes queen, 20 by 30 inches and king 20 by 36 inches. However, its thickness is unavailable due to the 3-in-1 design that makes it versatile, when it comes to using. It comes compressed and packed with eco-friendly materials. You will notice that it unfolds immediately you remove it out of the box and starts to inflate. However, if it takes time let it, until it fully forms. You will notice that it is very soft and dense than other memory foam pillows but supportive when it comes to using. Moreover, it has a certain smell during the first encounter, but it easily dissipates after a day of use. You can throw it into the dryer with a dryer sheet to get rid of the smell quickly. Some people have also suggested airing it, but the dryer works faster, enhancing its fluffiness. Apart from this irritating smell, this miracle bamboo pillow works just fine. It improves your sleep no matter the weather or the quality of the surrounding indoor air. You can rest assured you will always sleep well and wake up relaxed and happy with this pillow. Getting it easy, especially if you want to make an online purchase ASAP, Amazon is your best friend. You just make the specific search and you will have what you want in no time. Besides, you can read reviews of the pillow as well as Q&A section for more details of your purchase and proceed to order it. There you have it, a glimpse of the miracle bamboo pillow reviews. Of course, you can test it before buying but they are definitely one of the best pillow in the market. You can always opt for the king size or queen size. The choice is yours as performance is all the same. Moreover, you can ask for recommendations from family and friends who have used this brand of pillow, if you think the miracle bamboo pillow reviews are an exaggeration. All they will tell you is that it is one of a kind, comfortable, durable and supportive.